Well, there I was on my third and last day of my fall mountain extravaganza. I had spend the night at Julia and Stefan's house and did not leave until after breakfast or about 8am. Originally I had wanted to do Germany's third highest mountain in the Allgäu mountains of Germany, but that would have been another 2.5 hours of driving and because of the late hour (so to speak) I decided to do something a bit closer. Also, I was pretty sore from the previous day's outing and because I still had to drive back to Belgium for 7 hours later that day, I thought a less strenuous hike of maybe 6 hours would be perfect, because then I could be back in Namur before midnight. I decided to do something in the Kaiseralpen, the area I had visited during Easter with Volker and which was visible from Julia und STefan's house. I drove the 80 minutes or to the Eichelwant trailhead in Kufstein, Austria, but did not get going until almost 10am and it was already getting pretty warm. Another beautiful day, but of course I was about 4 hours late for my usual and preferred early and cool morning hiking. There were lots of other people out on the trail, which is fairly steep. About 30 minutes into the hike, I realized that I had forgotten my water bottle. Bravo, my backpack was full of heavy via ferrata gear (which I would not use at all all day), but the most important item I forgot. Luckily, I knew that there were two huts on the way, and the signs at the trailhead had announced that both were open. There I would stop and drink a few glasses of water. I quickly passed most other hikers on the trail and after about 1 hour got to the Ritzau Alm, where I briefly stopped for my first glass of Apfelschorle. AFter 1.5 hours I arrived at the Vorderkaiserfeldenhütte. The host was fortunately able to produce an empty water bottle, which I filled with tap water and took with me. I also drank another 0.4 liter glass of Apfelschorle. Up to now I had probably drank more that I normally consume during an entire hike, but it was really hot and maybe I was still dehydrated from the 3 beers I had the previous evening. After the Vorderkaiserfeldenhütte, the large path that is used alike by cars, men and beast (cows mainly) turned into a very steep and rocky trail that got me 30 minutes later to the first peak of the day, the Naunspitze and then another 20 minutes to the Petersköpfl, at 1745 meters. The Naunspitze stood by itself sort of but the Petersköpfl was just the beginning of a plateau stretching all the way to the Pyramidenspitze and therefore not a very prominent summit. There were other hikers on both summits and I did not stay linger for too long after taking the obgligatory summit shot. From the Petersköpfl I had a clear view of my actual destination, the Pyramidenspitze, and even though a sign declared it to be 2 hours away, I thought the distance could easily be covered in half that time. Sure enough it took me almost two hours. Did I mention that I was pretty sore from the previous day's outing? Furthermore, the trail went up and down across the plateau and was rather steep in place even if it was just for short sections at the time. The entire plateau was covered by short pine trees until a few hundred meters before the summit of the Pyramidenspitze. I met few other hikers and was even able to tag another summit (even though there was no cross or marker), but which I identified later to be Elferkogel (???). A few other hikers were at the summit when I got there. As most mountains in the Alpes, the Pyramidenspitze summit was also marked with a two-meter cross. I sat down, ate my stinky Camembert cheese sandwich, and took in the surrounding landscape. To the south I could make out the Wilder Kaiser range, whose highpoint, the Ellmauer Halt, is a good 200 meters higher than the Pyramidenspitze. To the west I could see the way I had come via Peterskoepfl. The views to the north and east were mainly characterized by nice green valleys with a view farms and villages scattered throughout them. Quite scenic. I asked someone to take my summit picture before packing up my things and getting going again. 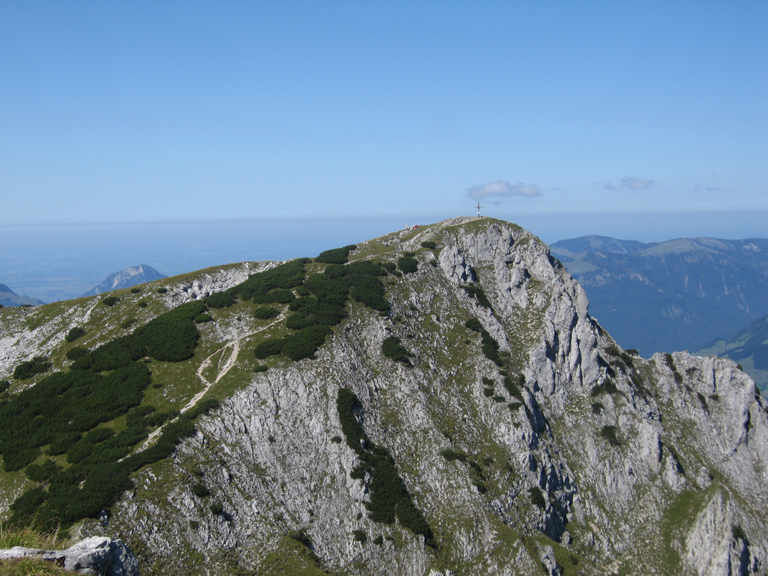 The Pyriamidenspitze, at 1997m is a very frequently visited summit, because most people, I assume, mistake it for the highest point in the Zahmer Kaiser range. However, according to the map there should be a peak 5 meters higher than the Pyramidenspitze about a few hundred meters to the south. Interestingly, from my location at the time, it was not clear to me which one was that higher peak. It could not be too far away and because I wanted to reach the true high point of the range and because of it being above 2000m, I set out to find it. I took the trail down towards a saddle between the two peaks and immediately found a use trail leading up again. About 10 minutes after leaving the Pyramidenspitze, I stood on another peak, called Vordere Kesselscheid. The high point was marked by a bit stone cairn, but even from here I was uncertain if this was the 2002m peak or whether it was further to the south. The summit I was on looked about the same height than the Pyramidenspitze, and not 5m higher, but from experience I knew this to be very deceptive in the mountains. Still I wanted to make sure that I had reached the highest point and explored the surrounding area a bit more. Soon, I came to a drop off leading down into a gravely valley, before it led up again to the other summit. However, after consulting the map again, I realized that the other summit was too far away to be the 2002m Vordere Kesselscheid and I was just certain that I had reached the highpoint. The other summit is acutally a good 20meters below 2000 meters, but as I said before, it is always very deceptive in the mountains, distances and heights, etc. I thus backtracked my way to the high point and took a few more picture before heading down the mountain. The descent was pretty steep for a while and after two days in the mountains, I could really feel fatigue no coming on. I wasn't moving very fast anymore and it took me more than 90 minutes to get back to the Ritzer Alm, where I stopped for another Apfelschorle, before jogging/walking quickly down the remaining trail to arrive at the car about 6:45h after I had set out. The topo map showed a swimming pool not too far away and I stopped there quickly to take a shower and put on some clean clothes before I began the long 700 km drive back to Belgium that night. Somehwere in Germany at a rest area, I picked up a hitchhiker from California who wanted to go to Southern France. He stayed with me for about 3 hours, which was very convenient, because he kept me from falling asleep. I eventually dropped him at a French rest stop near Metz, which was a good position for him to catch a ride south. Conincidentally, he was working on a farm in Southern France in the Parques des Cervennes, only 30 miles from the town of Frolac, where I had spent a night just a month earlier. The world is small sometimes. I arrived back in Namur at 0:30 in the morning, very tired but well content after a fun three days in the mountains.